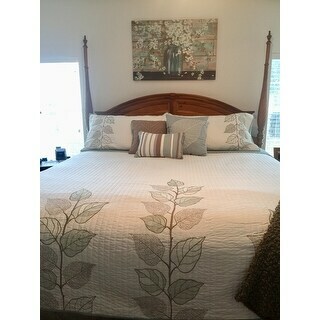 This beautiful 6 Piece Reversible coverlet set is a classic stylish look with an embroidered leaf print. Caelie is blue and white with subtle stripes that add texture. The coverlet reverses to a soft blue. With a microfiber polyester face and a brushed fabric reverse, this coverlet is soft to the touch and machine washable for easy care. Two matching standard shams and three embroidered decorative pillows complete the look. Queen size features two rows of embroidery, King size features three rows. The quality of the coverlet set is really good; it is wide enough for a good drop on both sides of the bed. It could have been a couple of inches longer. I preferred the blue side of the quilt for my purpose, but the white side with the embroidery is also beautiful. Because of the way the product is presented, it's hard to see that the design is only on the bottom third which is hidden if you have a baseboard on your bed. Also, I have a deep mattress and this comforter just barely fit. I am disappointed that it didn't work out for me...it has been returned. I bought a king for a queen bed because I didn't want to use a bed skirt, but ended up using one anyway. It doesn’t touch the floor but looks great! The quilt is poly outside cotton filler but not too light or heavy weight. The three accent pillows are polyester inside and out and all pieces are true to color. It's perfect for my guestroom. Online, the picture shows only two verticals rows of the leaves at/near the bottom. Mine has three and looks to be centered. I will fold over and stitch down the excess fabric on the king sham; as expected they are much longer than the standard. The quality is superb. After having this a while, guests complain that it makes them hot; likely doe to the polyester fabric, not because of weight. I love the Madison Park Jocelyn 6-piece coverlet set in King. It looked great on my bed and the colors perfectly matched my bedroom color theme. However, I really wish the width is bigger by at least 6 inches. An additional 12" in width would be perfect. I love this set, but wish it was just a couple inches wider. It is very soft and the colors are beautiful! My recent guests were very surprised that I purchased this at Overstock. They thought it looked great and matched our decor perfectly. This set was exactly the colors I thought the picture portrayed; a lot of times things aren't even close when you can't see them up close. The fabric is soft and cozy, isn't too thin, and the design is well done. ( a few loose threads, but nothing that ruined the pattern or anything.) The design is simple and elegant without being overdone, a key requirement for my significant other, who was specific that the new bedcovers couldn't look too "girly" or "satiny"... He didn't even mind the yellow, which is the reverse side of the spread. I had found sheets locally prior to purchase that had the same colors and the two combined look like they were made to go together. Spread is plenty long enough for my queen sized bed; reaches the bedrails on all sides. Not all coverlets do that. Accent pillows are a nice touch. Goes great in my master bedroom, with my copper aged wrought iron bed and warm yellow walls. This a lovely set for the price. We are about to make over our guest bedroom, and this set has the perfect color combination to blend with the wall color we have chosen. (Sherwin Williams “Watery”) This set evokes a spa like calm, and does not overwhelm the room. It is super soft, too. I love the look and this is the only set which had what I wanted. The reason I gave 4 stars and not 5 is because when I unfolded the quilt, there were spots/stains on the front of it! Two types. First some rusty, thin streaked ones - possibly dried blood from a needle prick at the factory. These were pretty easy to remove quickly. The other two looked to be ink or sharpie marker dots - near the top edge just below the binding. I’ll see if I can remove these or fabric paint over them, as the shams and decorative pillows will more than hide this issue. So when you receive yours, open it up fully and check. Yes a few loose threads here and there, easily trimmed with sewing shears. All and all it has that simple elegance I was looking for, so I will not return it with the few flaws. I think this was a random issue, and may not happen for another buyer. I like the design and it is perfect for spring/summer and even winter if you don't want a heavy bedspread. I did not realize that King came in different sizes. I needed a 120" x 120" and this is a "standard" King. BUT still love it ! I really like this coverlet set except that it is not wide enough for a standard king sized bed. It would probably work well for a Cal King, but definitely not for a standard king. I do like the fact that it is washable and looks just as great after it is washed. I bought an Overstock comforter set for a guest room and decorated around it. Loved it. But when it came time to switch to summer bedding, I had to match colors. This was absolutely perfect. As mentioned in another review, it's hard to see the design on the coverlet unless you have a long view from the foot of the bed. But the pillows more than compensate. Love it! Best item I've ever purchased from Overstock. The colors are beautiful: white, taupe (grey-brown) and seafoam. I mention the grey/brown because it will blend well with either grey or brown. Seafoam is not sage as another reviewer wrote, it's a beautiful greenish blue. Also no problem with my set regarding hanging threads. We ordered this set when we moved into our new home back in October 2014. I have washed the coverlet a couple of times and it comes out beautiful. It still looks brand new. The accent pillows are nice and firm and stand up well on the bed for décor. I would recommend this set. It is excellent quality. This set is amazing! The coverlet is soft like a nice cotton silk blend. It looks beautiful, like something you'd see in a 5-star hotel or resort. I am in love with it, and I believe it's perfect for any season. 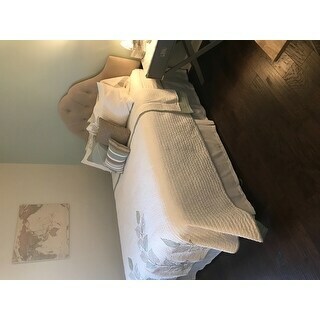 great quality coverlet for the price. Very pretty coverlet set. I didn't like the boarder on the end of the coverlet. It seems to be offset to the right. The seafoam blue is actually a light green. I really liked the set other than the border. I may order another to see if it looks more centered. Its very pretty, perfect for spring and summer and its good quality. This set is stunning! It has a nice weight to it and feels so soft. I put it in a brown painted master and it looks gorgeous! Love the light weight of comforter and soft material. Pleased with colors. Yes I will tell my friends! Love this set. It is wearing extremely well and I love the simplicity of the design. Love the look and it's the perfect weight for light cover. I've washed it several times and the stitching is starting to come loose. Otherwise, perfect! I bought this coverlet set for my mom. The colors went perfect with the decor in her room. She loved the details and quality. I would recommend this brand to my friends. This coverlet set is of good quality and you are getting a lot for your money! However, I returned it because the "gray" color was a brown color and would not match my bedroom. Had the colors been right, I would have kept it! "Would this be considered closer to a nice quilt fabric or comforter style?" "Is the other color grey or taupe? What color bed skirt will work best?" It is taupe and the set is beautiful and feels so smooth. I am using a white bed skirt. It’s more of a taupe. However, there is some grey as well. "Is the blue bedspread a blue, or more a green ?" It is really more of a light teal color. Google "PPG Sky Diving paint color". It goes perfectly with that paint on my walls. I also purchased the King size because I wanted 3 leaf patterns instead of 2. It was easy to cut off one side to make it fit a queen because the pattern is offset a lttle and not perfectly centered on the spread. Light green. Looks great with shades of teal and blue. "Is there embroidery detail on the reverse (blue) side of the coverlet?" No, there is no pattern on the blue side. "Is this coverlet reversible - can I put the white side down and the blue side up." Yes, you can put the blue side up, it's reversible. Yes, it is reversible, but the leaves on the bottom are not on the blue side. It's a beautiful quilt! "one picture shows 3 lines of embroideroy on the coverlet, the other shows 2 lines. Which is it? Also, is the bed skirt shown available? DEC"
Three, which was a pleasant surprise since I didn't see a picture with three, only two. That would have been pretty enough but I was delighted to have three. The king size has 3 rows and the queen has 2. Here is the bed skirt ITEM# 11498720. Like Linda D. I also have three embroidered lines on my coverlet as a king size. 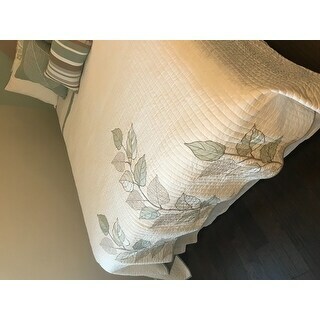 However, as another reviewer mentioned, the embroidery is only at the bottom section and if your bed has a footboard, the design will not show. That was a disappointing to me when it arrived although it is very pretty. "Does the yellow set have grey as the alternate color?" Hello MareKS, we try to represent the colors of our products accurately. Unfortunately, due to the difference in monitor colors we cannot guarantee that the color will match exactly what you see on your screen. Yes, in my opinion the grey is the alternate. Thank you for shopping with us.